Visit www.SolePath.org, where you'll find the free online course, 'The Tao and SoleIntending', a profoundly simple concept that connects the fundamental teachings of the Tao to a balanced intending and goal setting process to create your life. I believe that we all have an underlying yearning – one that is the same for each and every one of us – and that is to feel happier. To cope with our lives better; to feel that our life has meaning. CALGARY, AB, February 07, 2019 /24-7PressRelease/ -- In this life-changing SolePath course you will learn a simple, practical SoleIntending action that will help you create a happier life; a simple guided way for writing goals using the creative energy of the Tao. The SolePath Institute is the joint venture of two passionate women: Rev. Deneen Justason and Dr. Debra Ford. Rev. Deneen is the "creative community commander" and she is an intuitive creator and bringer of spiritual balance. Deneen has dedicated her life to being a SolePath certified mentor and SolePath certified analyst, known for her wonderful laugh and beautiful caring energy. Dr. Debra Ford is well known as an inspirational teacher and spiritual mystic. SolePath is an original body of work, written and created by Dr. Debra. She prides herself on being an "inspirational connection communicator" and spends her days teaching and guiding others to purpose and a happier life. Let's speak today about SoleIntending. This is a powerful tool within the SolePath experience. Why is it important at this time of the year? It's always a good time to write intentions, but particularly at the beginning of the New Year. Let's say you have a businessman, a celebrity entertainer and a retired military person; is there a different approach for each of these types? How is this determination made? Do you seek different outcomes for different types, or is the end goal the same in all areas? That's the beauty of the SoleIntending process – it is a very personal and unique experience. It is different for each person yet it works no matter what your life experience may be. It is simply a way of setting goals using the perfect balance of the Tao. You describe a "place of calm" in the description of SoleIntending. Please explain how this works, and what sort of place should participants create? Once your intentions are written, then it's time to find a place of calm within yourself where you trust that what you are asking for will be delivered to you in the perfect way and at the perfect time. SolePath has been described by you as a "happiness business", which has truly wonderful connotations. Please tell us how and when SoleIntending fits into the SolePath process? We offer a free online course called 'the Tao and SoleIntending' that is a great place to start, the beginning of creating the happy life that you desire. Here at the SolePath Institute, we are in the happiness business. We teach tools for living a happier life; practical, easy to apply techniques for being happier. It is possible to be happier. The Tao is the natural order of the universe. The Tao keeps the world balanced and flowing. The Tao encompasses chi, the essential energy of 'all'. For further reading please visit www.SolePath.org, click "Online Courses", and scroll down to find information about SoleIntending. 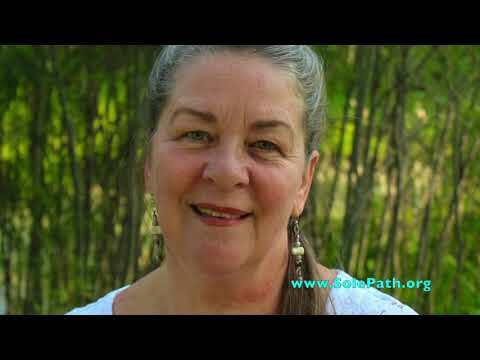 Find your SolePath today! This is the audio counterpart to the SoleIntending Interview with Dr. Debra Ford of SolePath Institute.